Love it or hate it, if you’re going on a cruise to the Bahamas, chances are good that you will visit Nassau. Some folks will tell you don’t get off the ship. Others will tell you to only do an organized excursion. We decided to tour the city on our own and loved it! 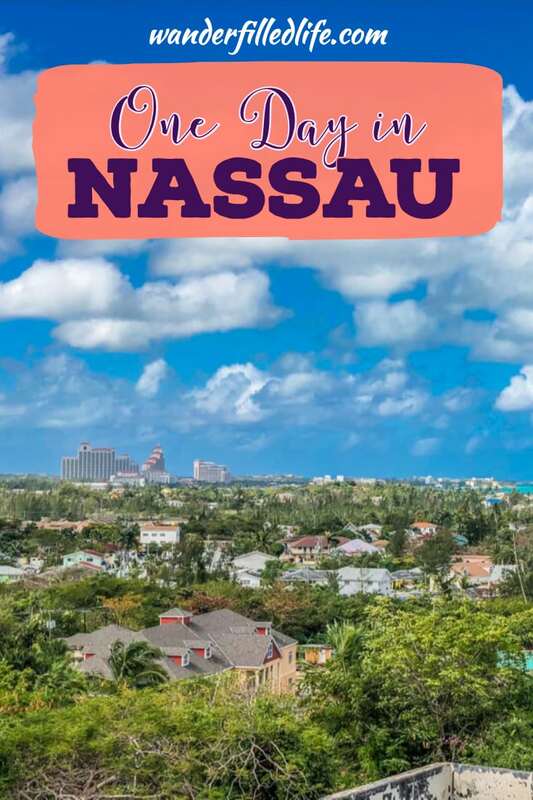 With one day in Nassau you can easily see historical forts, do some shopping and visit a distillery. Located on New Providence Island, Nassau is the capital of the Bahamas and its largest city. In fact, about 70% of the country’s residents live in Nassau. With that, expect some of the same congestion and, yes, crime that you might find in any large city. That said, we felt safe waking the streets to visit a number of different sites. 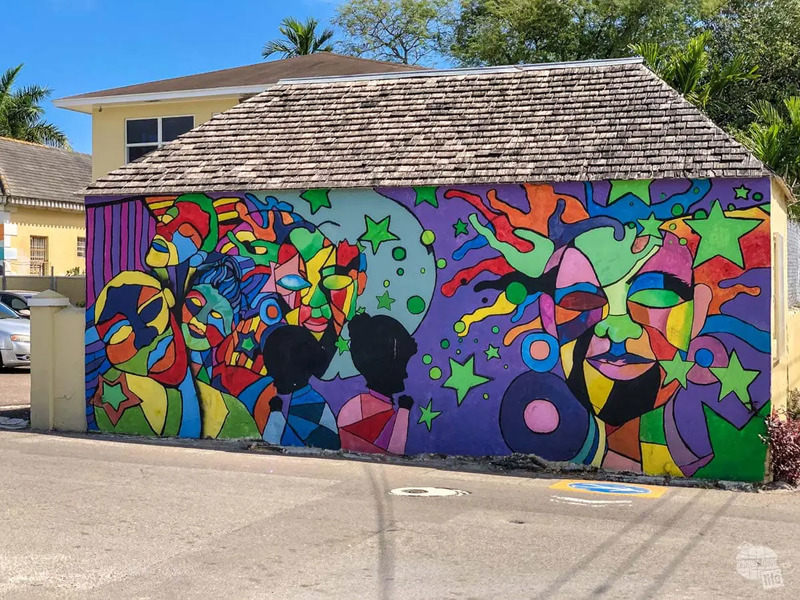 We loved the murals in Nassau. If you’re worried about safety or just don’t feel comfortable navigating on your own, you should easily be able to get a taxi. There are also a number of city tours that you could do with various companies to see many of the same sites we visited. But, again, we felt perfectly safe walking all over the city during the day. 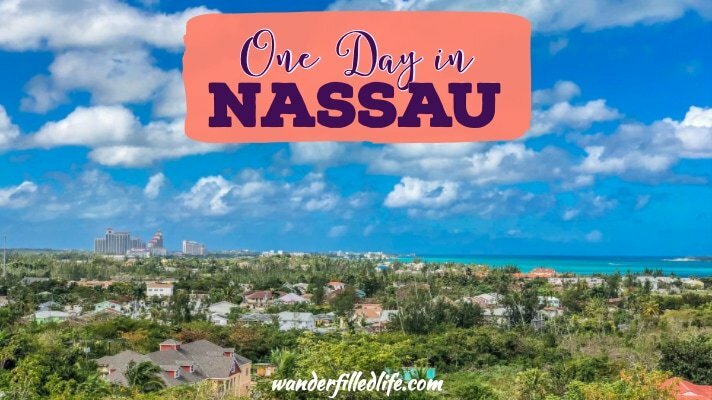 Knowing that we’d be splurging on an excursion to Lucayan National Park on Grand Bahama Island, we decided to try to keep our costs down for our day in Nassau. 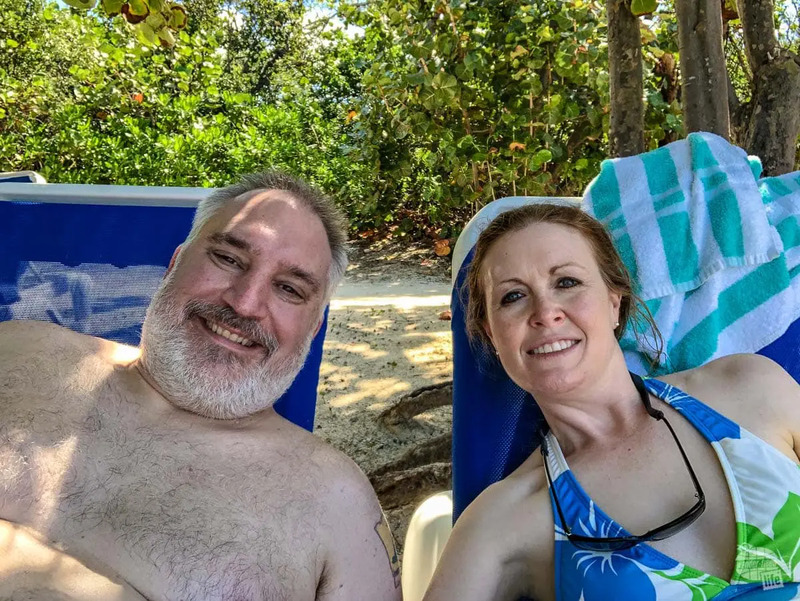 Our cruise itinerary also included one day at Norwegian’s private island, Great Stirrup Cay, so we knew we’d get some time relaxing on the beach there. Relaxing on the beach at Great Stirrup Cay, Norwegian’s private island in the Bahamas. In an effort to have different experiences in each port, we opted to tour the city in Nassau. 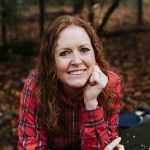 We considered doing an organized tour, but ultimately decided that we could see the highlights of the city on our own without too much trouble or expense. Organized tours may be easier and may feel safer, but they rarely will be cheaper than touring on your own. That is especially true if you are able and willing to walk to avoid transportation costs. For us, having the flexibility to do exactly what we want to do at our own pace is important. 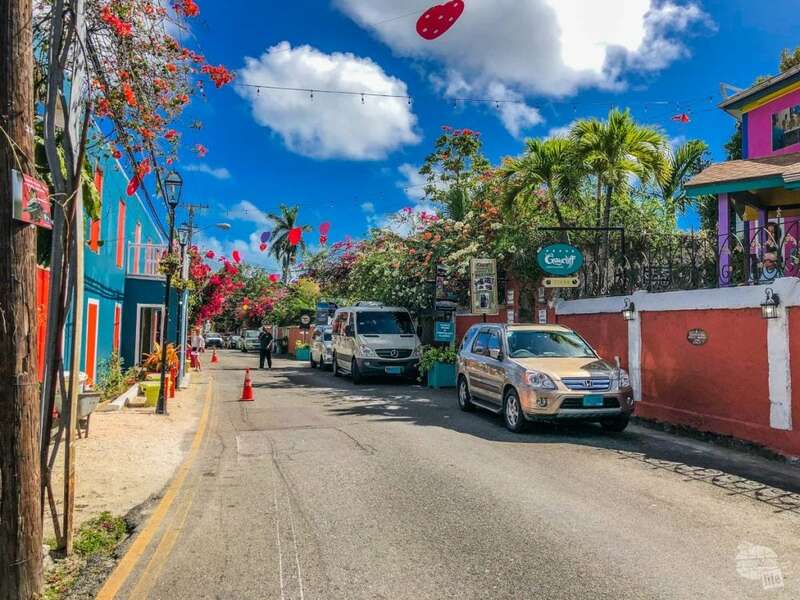 Walking the colorful streets of Nassau. With just a little research (thank you, Pinterest! ), I discovered that the highlights of Nassau are all within walking distance of the port and easy to access on your own. One article I read reminded of the app GPSmyCity (available on the App Store and Google play), which I had previously downloaded but never used. GPSmyCity provides walking tours for more than 1,000 cities worldwide along with offline maps. Yes, this means you can use the app to explore even without a cellular or data connection! 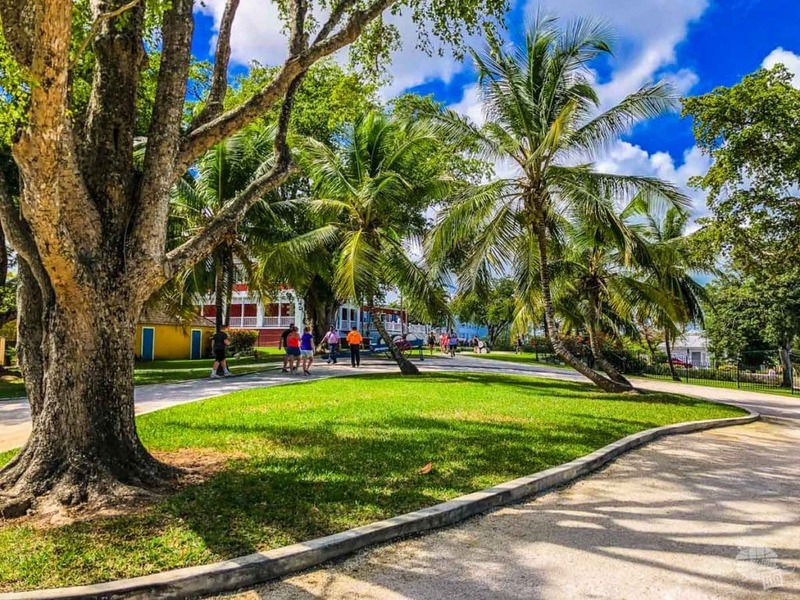 There are several different Nassau sightseeing walks available on GPSmyCity for free. You can also create your own custom walk, which is what I did. I found the app easy to use, though it did take a bit of trial and error at the beginning. The offline map is great once you’re in the city and the guide includes some basic information about each site. The one mistake we made once in Nassau was underestimating the scale and not starting at the right spot. That wouldn’t have mattered too much, other than we knew that we wanted to visit the John Wattling Distillery at the end of our day. The distances really weren’t too bad, but we did a bit more backtracking than we would have liked. If you’re not interested in the distillery, then you might consider starting at Fort Charlotte. 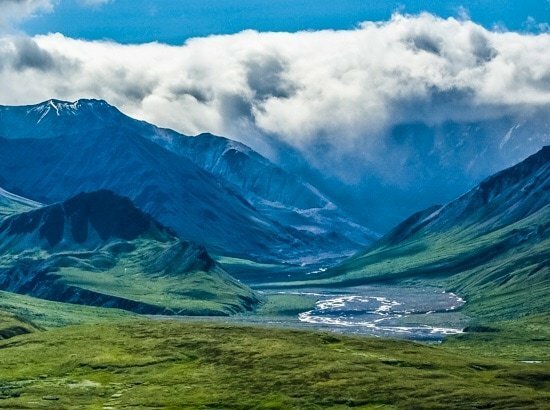 It is the furthest site, then you can work your way back towards town. You could also save Bay Street and the Straw Market until the end. I definitely suggest this if you plan to do a lot of shopping. Those, along with Rawson Square and Parliament Square are close to the cruise port. If you want to return to the ship for lunch and head back out for shopping, those would be good sites to save for the afternoon. A few other attractions that you might be interested in are the Ardastra Gardens and Zoo, the Pirates of Nassau Museum and the Balcony House Museum. We did not visit any of these sites but they were all recommended on several different itineraries. If you have limited time, my vote for the absolute must-see attractions are the Queen’s Staircase and Fort Fincastle. Both are located just about a 1/2-mile from the cruise ship dock and you can visit both for free! 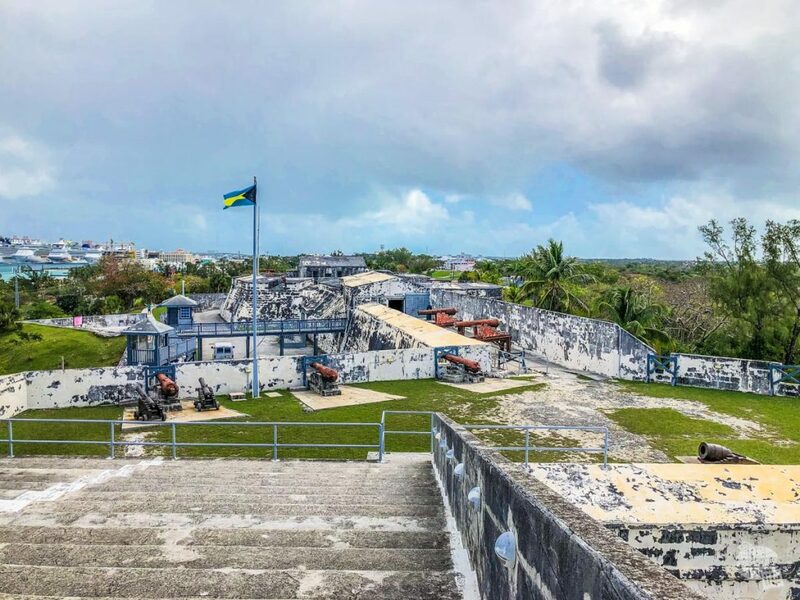 Fort Fincastle is a small fort overlooking Nassau right next to the Queen’s Staircase. Lord Dunmore built the fort in 1793 atop Bennet’s Hill to protect Nassau and its harbor. You can tour the inside of the fort for a small donation. We had already toured Fort Charlotte (see below), so we did not pay for the tour at Fort Fincastle. Instead, we just took a few pictures of the outside of the fort and enjoyed the view over the city and port. 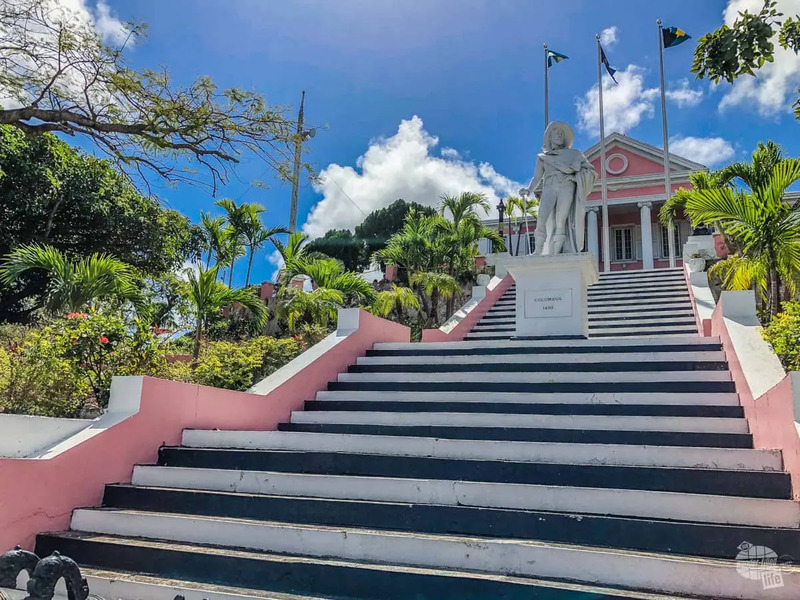 The Queen’s Staircase, also known as the 66 steps, is adjacent to Fort Fincastle. The staircase was built by slaves in 1793 and provided a direct route from the fort to the city. Of course, there are other routes now. The area if very picturesque and we really enjoyed the shade provided by the lush vegetation here! This is a great place to escape the hot afternoon sun, relax for a few minutes and take some pictures. 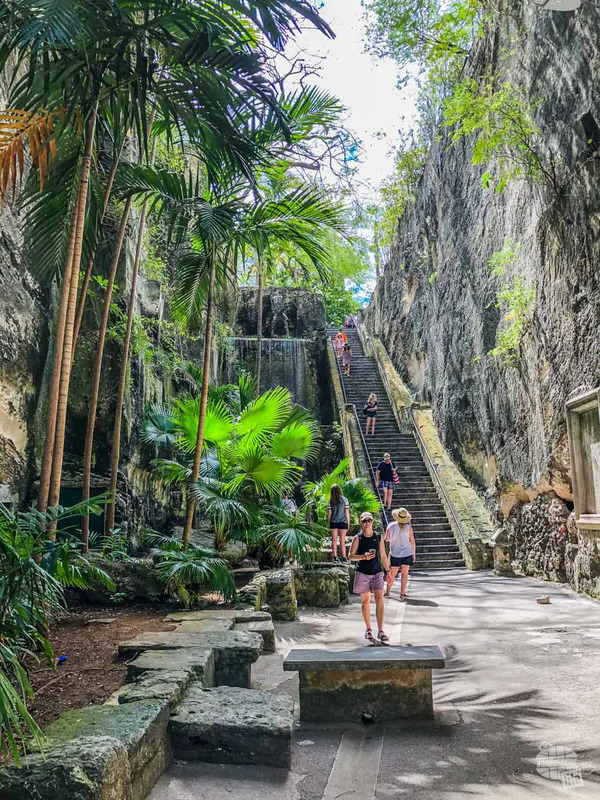 It is worth noting that, according to the Bahamas Tourism web site, there are only 65 steps visible now at the Queen’s Staircase. When the city paved the pathway, the bottom step was buried under the asphalt. We only spent about 15-20 minutes here. You could easily spend longer if you are touring the fort or enjoying the shade! 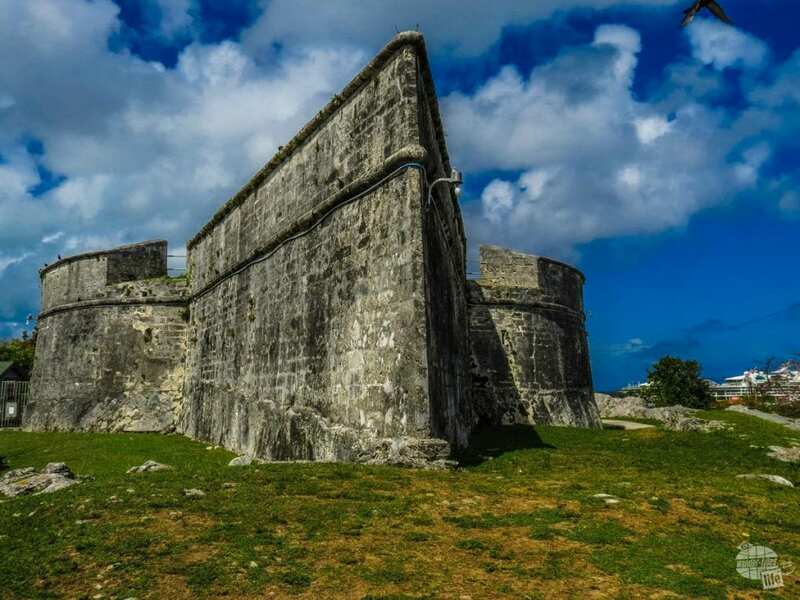 Located on the west side of Nassau, about a mile from the cruise port, is Fort Charlotte. 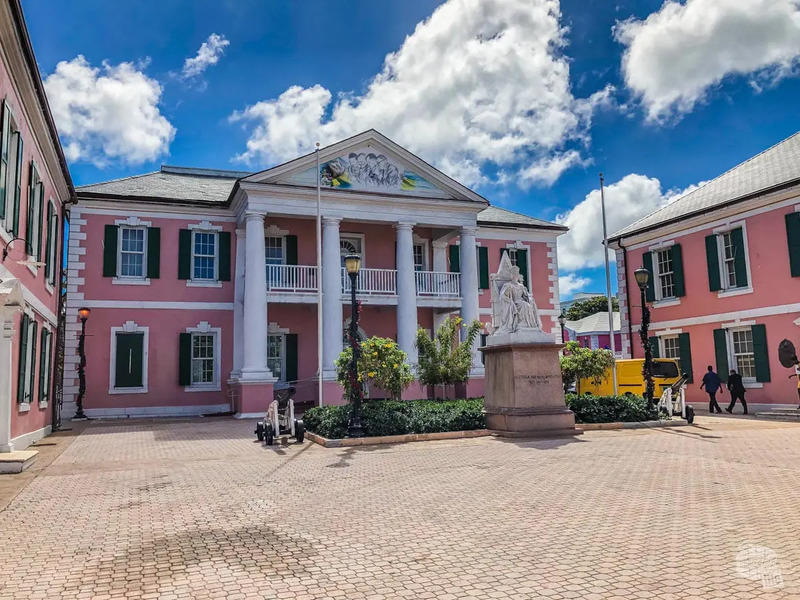 While it is more difficult to get to due to its location, Fort Charlotte is much larger and much more impressive than Fort Fincastle. There is also a small fee to tour the grounds; we paid $11.20 for two adults. Fort Charlotte was built in the late 1780s to protect the west end of the harbor. The complex also includes Fort Stanley and Fort D’Arcy, which were added in the 1790s. These additions provided more cannon and ammunition storage to better protect Nassau and its harbor. As expected at any fort, the views from the top are impressive. From here, you get a great look at the crystal blue water of the Bahamas, the harbor and Paradise Island. The fort itself is also impressive in size at more than 100 acres. A moat with a wooden drawbridge, numerous underground passageways and dungeons provide ample opportunities for exploration. Despite being armed with 42 cannon, the fort never fired a shot in battle. Not even when the Americans attacked the city during the Revolutionary War! While the powder room at Fort Charlotte was well-protected, it was also quite damp. The fort lost half of its powder to moisture. You can tour the fort on your own, using the numerous signs and displays to guide you. You might also find tour guides (working for tips) available to provide a complete history and tour of the fort. We had no problems exploring on our own. The walk to the fort from the cruise ship is not easy but doable. There are a couple of sections where there is no sidewalk. Still, traffic was not bad and we had no problems at all. I would allot 20-30 minutes to walk from the cruise port; more if you expect to explore and take pictures along the way. We spent about 30-45 minutes at the fort itself, though you could easily spend an hour or more there. If you are looking to shop while in Nassau, Bay Street is the place to do it. Here, you’ll find a variety of stores, including some duty-free shops, and restaurants. Of course, you’ll find many of the typical duty-free stores you find at every cruise port. That said, we did not find as many duty-free liquor stores in the Bahamas as we have found in many Caribbean ports. 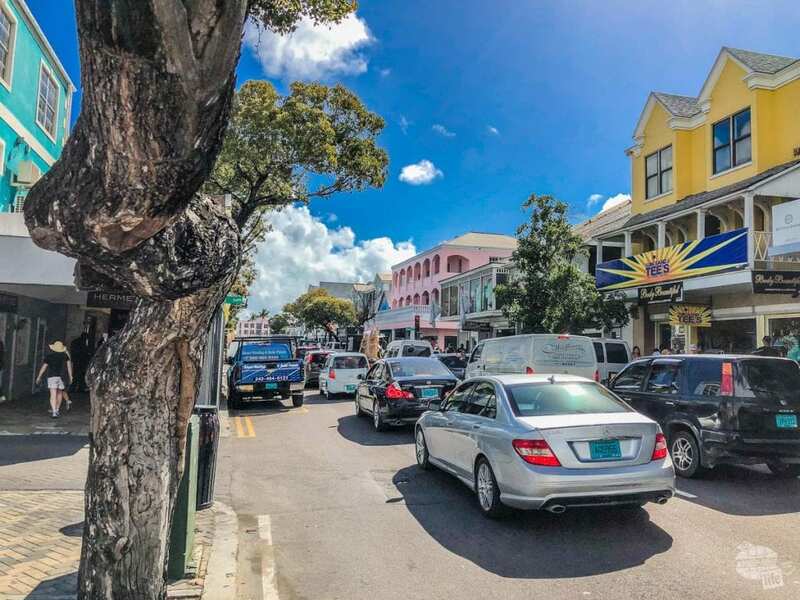 Bay Street in Nassau is crowded with both shops and locals trying to make money off the tourists. For local trinkets and crafts, head to the west end of Bay Street to the Straw Market. 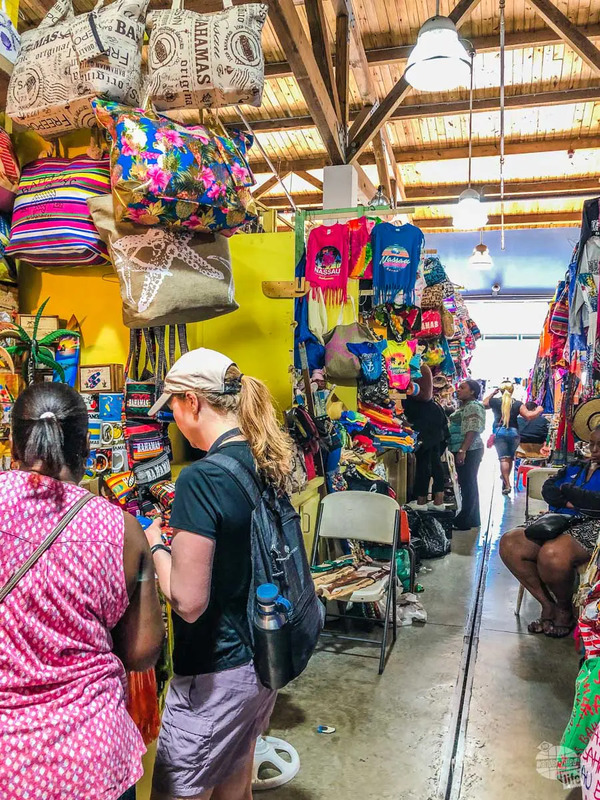 In this giant maze of a market, you’ll find more booths than you can count selling the typical souvenirs, both mass-produced and hand-crafted. Even if you’re not interested in shopping, you should take a few minutes just to wander through and take it all in. Bonnie hunting for a souvenir in the Straw Market in Nassau. We stopped into the Straw Market just briefly to get a shot glass. You can also find t-shirts, bags, postcards and most anything else you didn’t know you needed here! While this is a great place to kill some time or escape the sun, it is very crowded with booths, even without a lot of people. If you don’t like tight spaces or crowds, you probably won’t want to spend much time here. 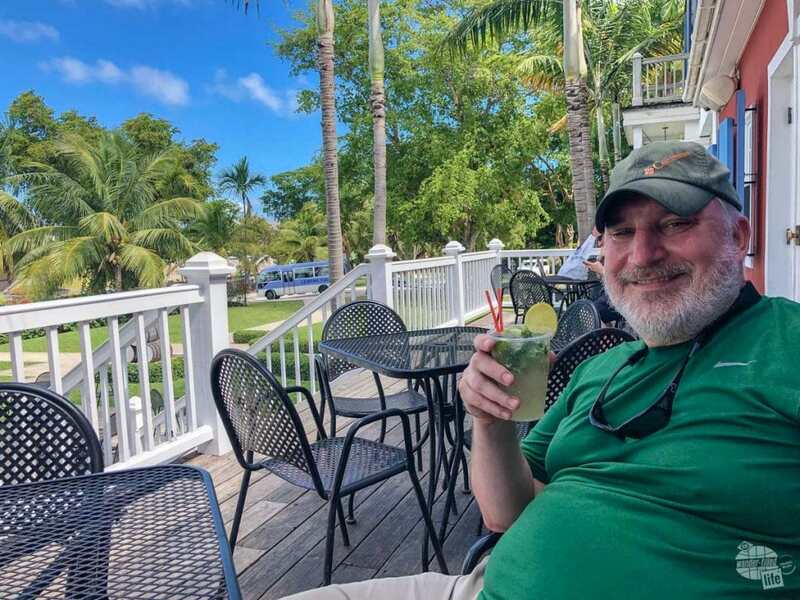 As the most popular (and, perhaps, only) distillery in the Bahamas, I highly suggest a visit to John Watling’s Distillery if you enjoy rum. 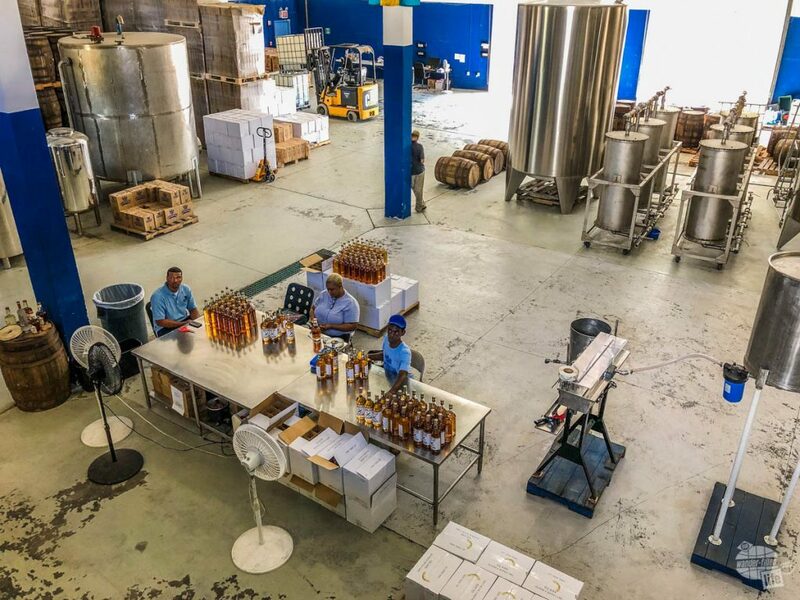 The distillery is located on the beautiful, historic Buena Vista Estate not far from Downtown Nassau. If you’ve seen Casino Royale, you might recognize the estate as it was used as a stand in for an African embassy in the beginning of the movie. John Watling’s Distillery is housed on an old plantation in Nassau. As you enter the property, enjoy the grand lawn and lush vegetation – and look for a few free-roaming chickens! The main house holds the tavern, where you can sample the rum and sip on a cocktail, and the bottle shop. Behind the house, in the old barn, is where you will find the barrel storehouse and bottling line. Workers labeling bottles of rum at John Watling’s Distillery. Yes, the bar is where you ultimately want to be, but the free, self-guided tour only takes a few minutes and is well worth your time. A few signs explain the distilling process. 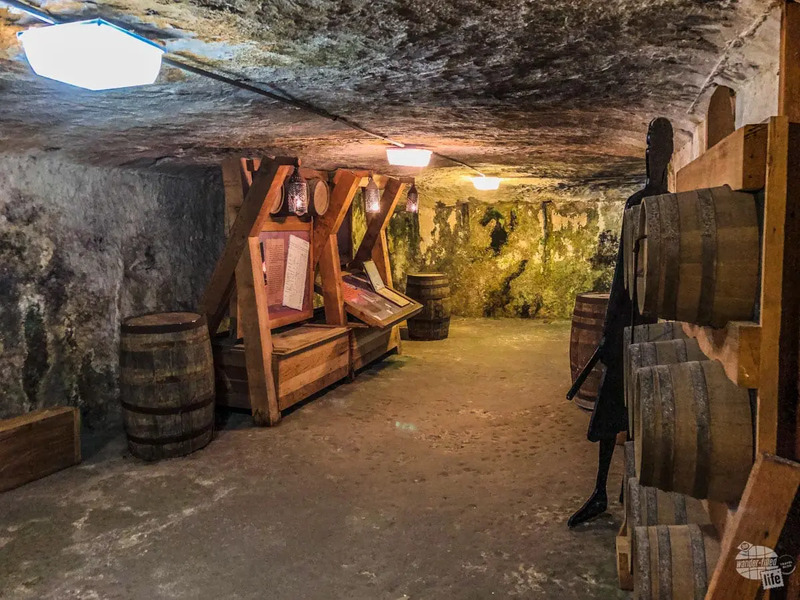 You’ll also see the massive storeroom of aging barrels and the very small operation of locals hand-labeling every bottle. At the bar, you can sample each of John Watling’s four rums for a small price. We opted for the full flight, which includes one snifter each of the Pale, Amber, Buena Vista and Single Barrel rums. If you’re more interested in a cocktail, you can find traditional rum drinks such as a mojito, daiquiri or rum punch along with a few signature specials. 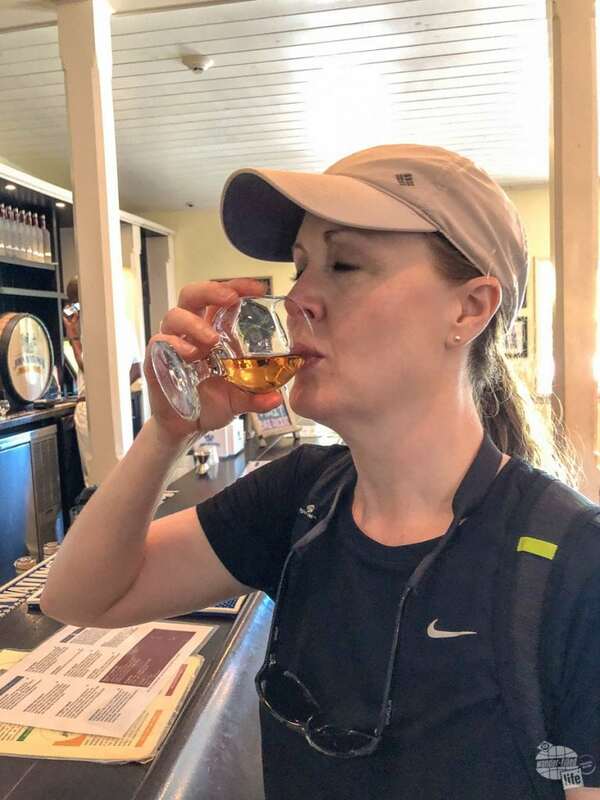 Bonnie sampling some of the rum at the John Watling’s Distillery. We found the rum to be quite tasty and the mojito was one of the best we’ve ever had. The Single Barrel rum was especially nice, approaching a Scotch level of smoothness. Ultimately, though, we chose the Pale (white) Rum to bring home with us. The patio of John Watling’s was a perfect place to enjoy a mojito made with their light rum. 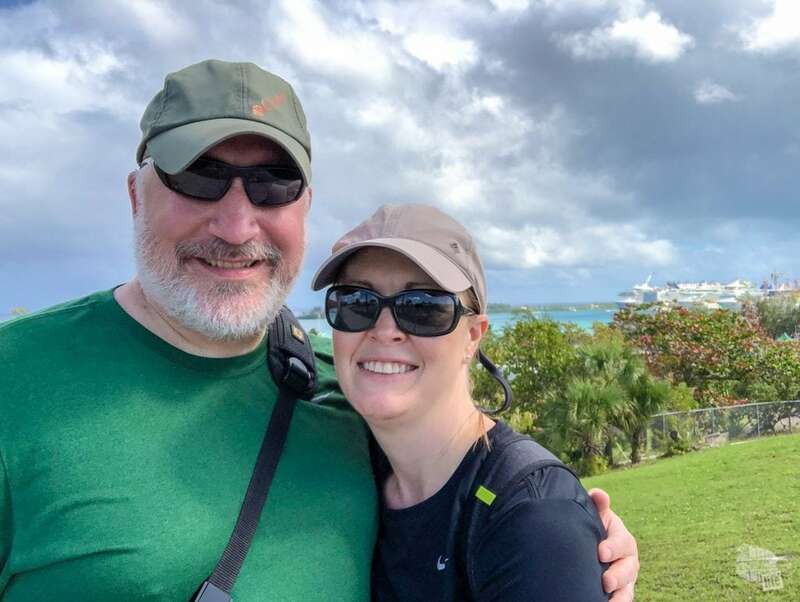 Even with Grant and I sharing a four-snifter tasting and a mojito, we were very glad to be walking back to the ship, not driving! I definitely suggest saving your distillery visit for the end of your day. If you are visiting Fort Charlotte, you can easily stop at John Watling’s on your way back to the ship. When you first exit the port area, you will likely be inundated with locals selling tours and trinkets. This is much like any other cruise port. If you just keep walking you’ll escape the crowds within a block or two. You can use the map on GPSmyCity to help you navigate your way through town, even if you don’t want to do a full walking tour. Just be sure to download the map in advance using wifi or cellular data and you can use the app without cell phone service. The exchange rate for the Bahamian dollar and the US dollar is 1:1 and has been for a while. US cash is widely accepted in the Bahamas, but change will likely be in Bahamian dollars. We never changed currency and had no problems using US dollars for a few small purchases. Before our cruise, several folks told us that Nassau was not a great city. Our take? While it certainly is not the best city we’ve ever visited, we did enjoy our time there. I suppose it all depends on your expectations and past experiences. 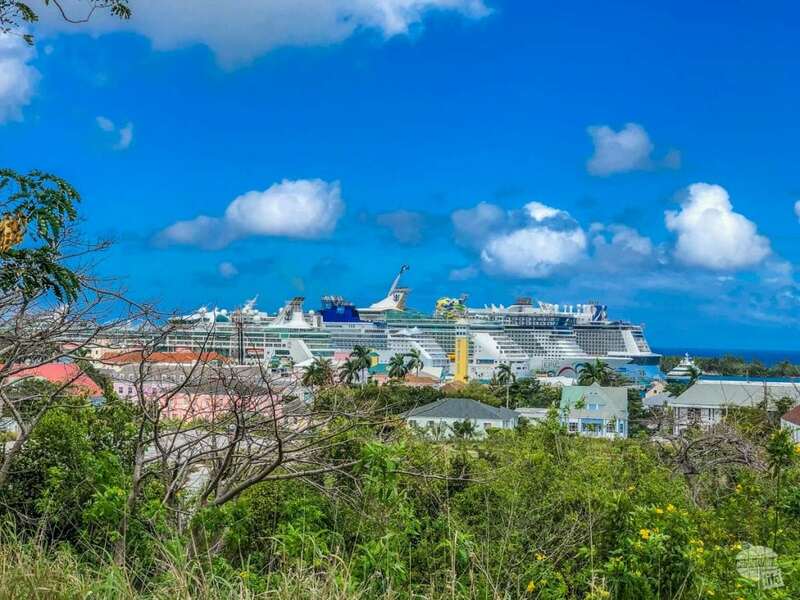 There were plenty of cruise ships in town when we were in Nassau. Yes, I know there is currently a US travel advisory for the Bahamas and for Nassau itself. Still, we felt perfectly safe walking around on our own during the day. We even ventured outside the downtown area as we walked to Fort Charlotte with no problems. 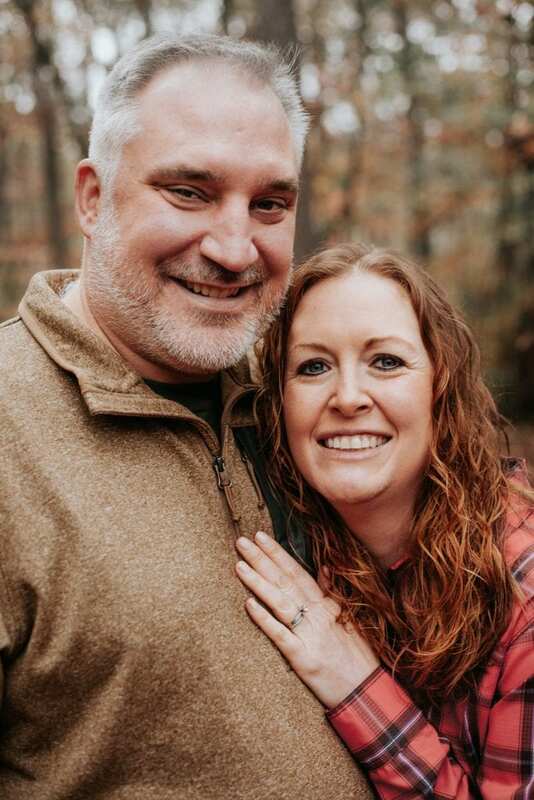 There were a few places that I was thankful to have Grant with me, but at no time did we second guess our decision to explore on our own or walk. If you only have one day in all of the Bahamas, I’d certainly encourage you to get to a beach and really experience the beautiful, clear blue water for at least a few hours. For those with a couple of days, exploring Nassau is a great way to really experience the country and its culture. The British architecture and history really is fascinating. We only spent a few hours off the cruise ship, but it was time well-spent and we very much enjoyed our day in Nassau.